I could smell it when I drove the back roads looking for a photo of the day. Somewhere some place, someone was cutting corn silage. It’s an unmistakable sweet, wet/sweet smell. 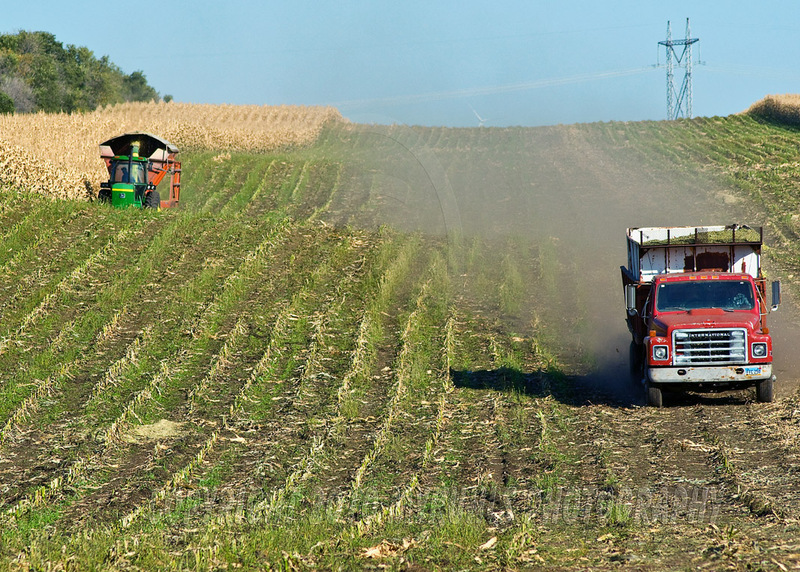 Growing up in the Tall Corn State of Iowa, I grew up with the smell, knew it well. 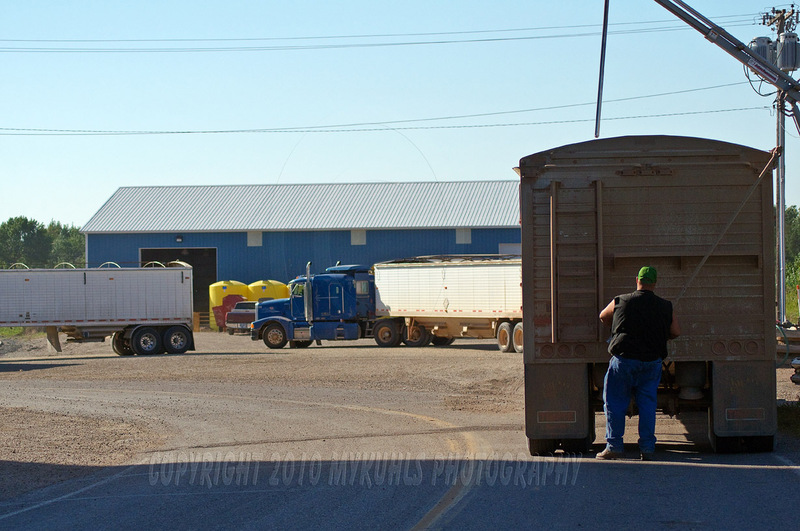 Then I saw the silage truck headed back out to the field to get another load. 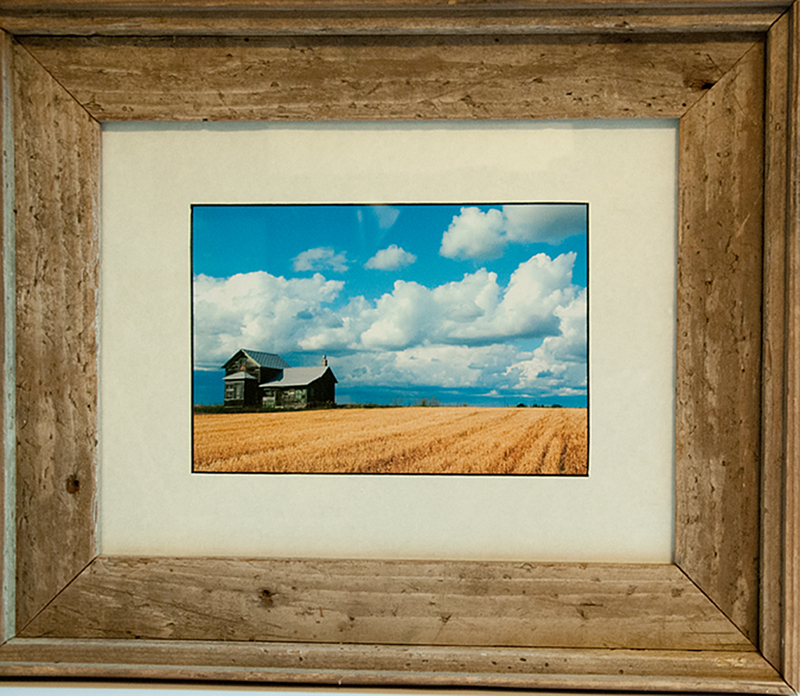 There he went, down the road out in to a field where a silage cutter was taking care of the corn field, getting it cut and chopped to feed cattle all winter. The trucks drove out in to the field to get a load dumped in to the box from the wagon pulled behind the tractor and silage cutter. There musta been a half-dozen trucks keeping up with the tractor and cutter, hauling to a silage pile about 3 or 4 miles down the road. I learned this was a neighborhood cutting bee. The owner’s wife was gravely ill and he was spending his time and money on her and her medical treatment. So, the neighbors got together and did the farmer’s work for him. That’s the way it is out here. We may not agree on everything, and sometimes downright disagree, but doggone it, when someone needs help, we’re there. That’s what these neighbors did…they were there for the farm family. Not only did they supply material relief and help, their involvement in their neighbor’s plight musta been an encouragement to the farm family. Would you agree? Sometimes it’s not what you do for someone, but just the fact you did something that really counts? 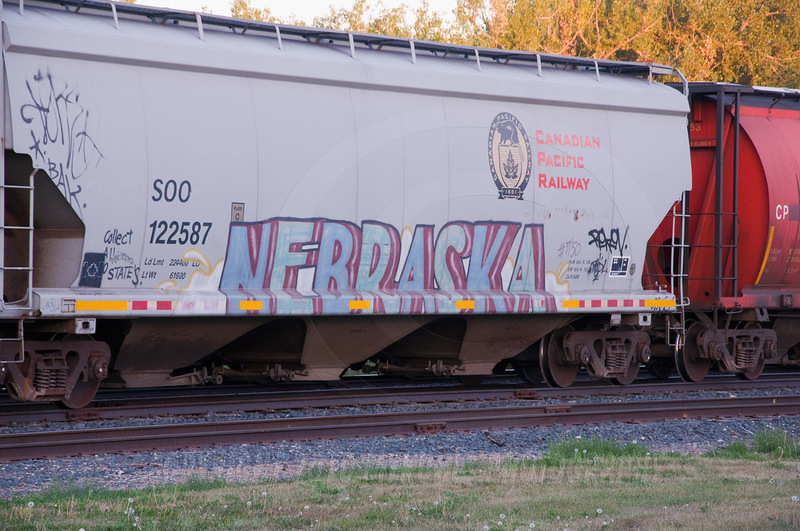 Nebraska has a pretty good graffiti artist, wouldn’t you say? 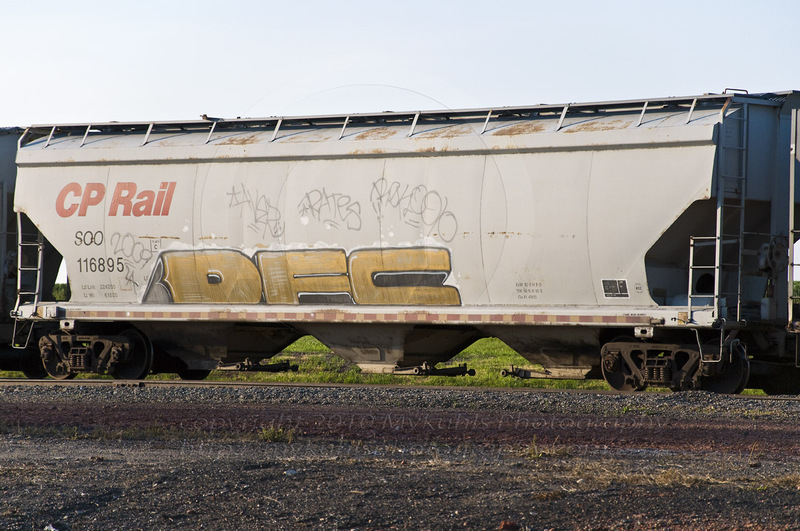 This grain car near the Wilton Grain Farmers Union Elevator is waiting for a load of grain, and is displaying the artwork some busy artist added. 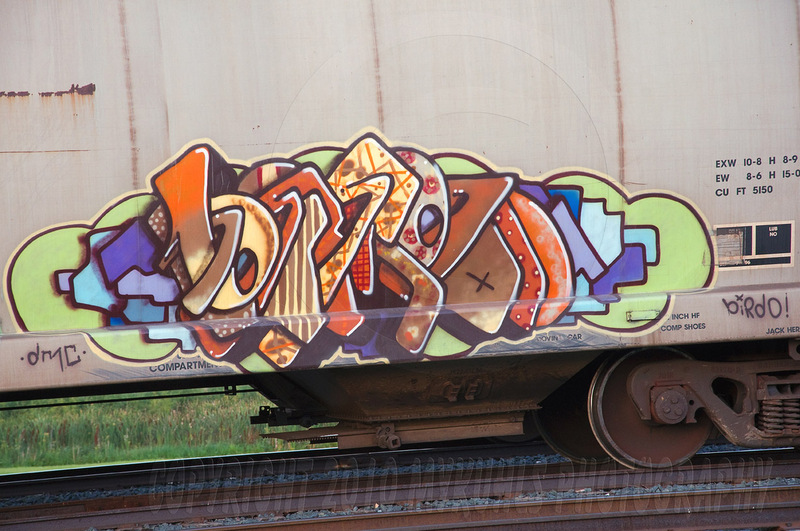 I often wonder why no one around here adds their touch to the grain cars? Is it a matter of respect? Of lack of inspiration? What is it? Actually that’s the question I ask most of the time when I see the graffiti, “What is it?” Or, “What does it say?” I can’t read it, but this one I could, “Nebraska” and the encouragement to add other states. Down the line a bit further another artist added his or her work, and this one I could recognize, also. It’s a bulldog. Can you read what it says by the bulldog? Over here on the left is an isolated image of that same thing. Let me know if you figure it out. There on the truck is what will be eaten in not very long. You might even be the one to eat it. Or it might go to a relief effort in South America, Africa or elsewhere. 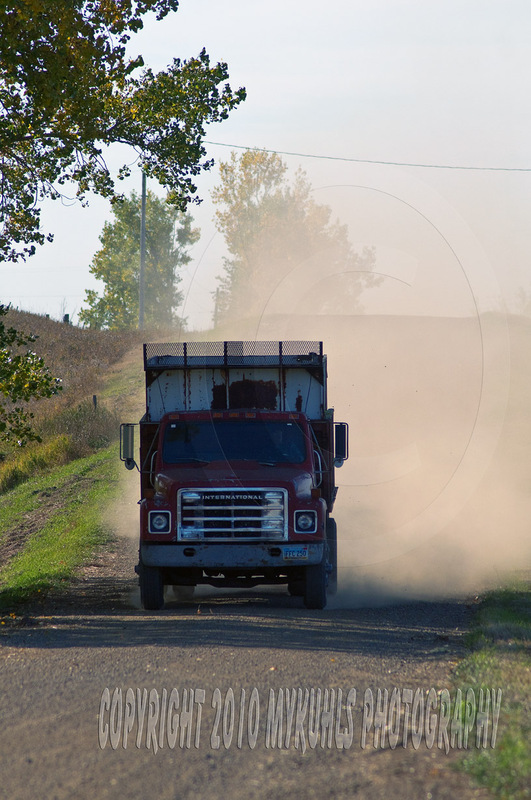 This farmer has just unloaded a hopper of grain in to his truck. Before he can unload more, someone will have to take that truck in to unload, maybe at his farm or in town at the grain elevator. He probably won’t stop combining though, and will keep adding the nation’s stores of grain. 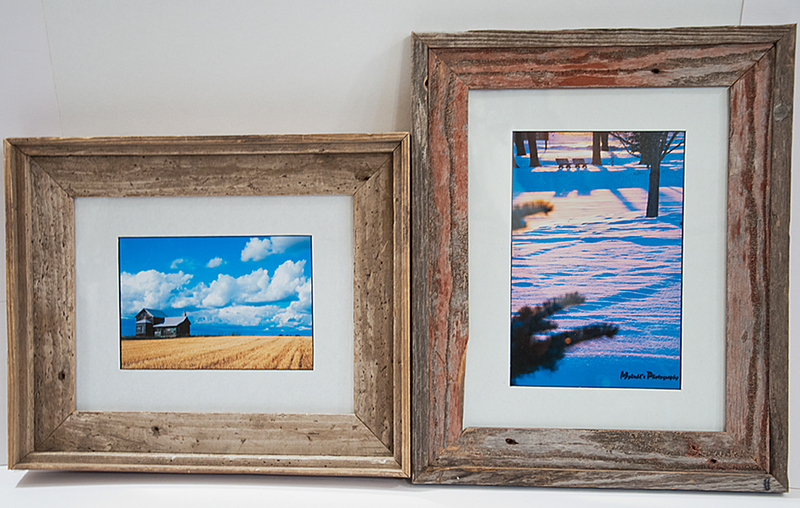 It’s that time of year when farmers haul their grain to market. 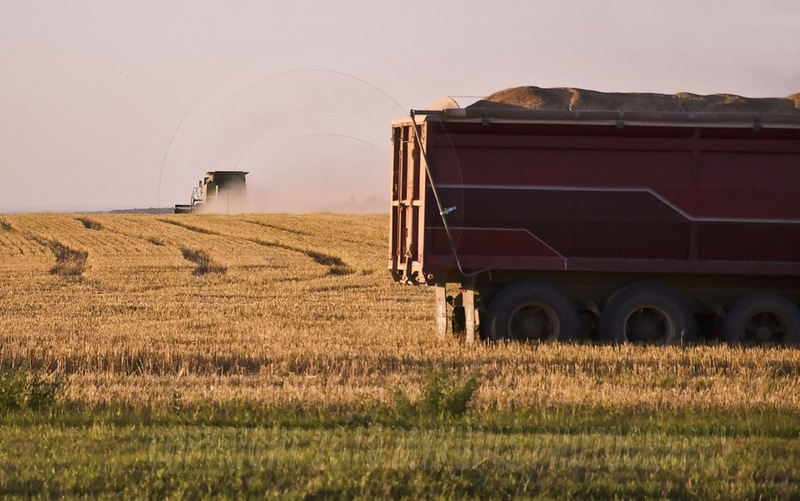 But unlike in years past when a tractor and flair-box wagon hauled the grain, farmers today use semi-trucks to get their crop to town. 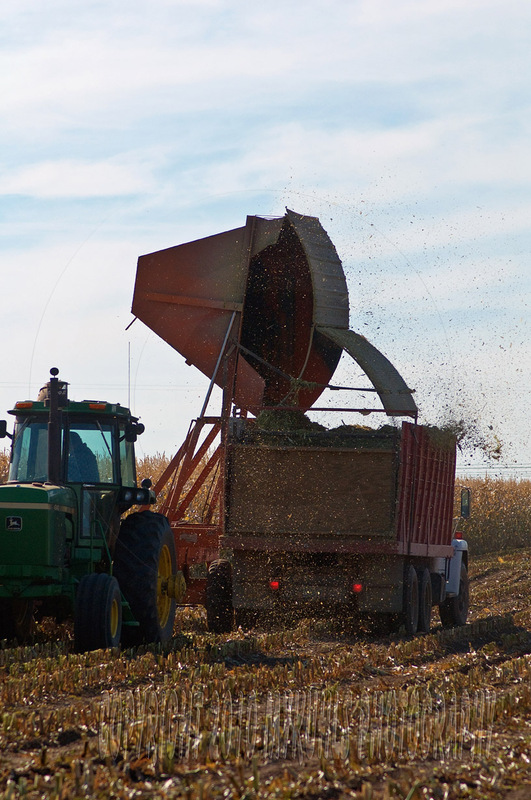 Drivers pull their trucks up under the sampling auger. They unroll the covering tarp so several samples can be taken. From that, the grain is evaluated and given a grade to determine the purchase price. 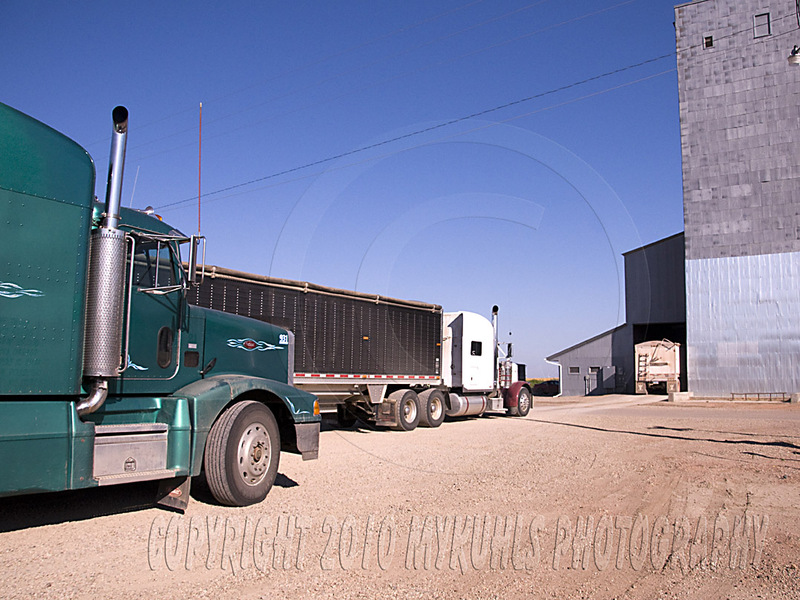 Then the pull in to the line to wait their turn to dump the grain from the belly of the trailer in to the elevator hopper where it is stored until sent to a mill elsewhere in the U.S.
Today, I had to weave my way through the trucks along the road, but I don’t mind. I like the sensation of harvest. The mammoth combines in the field to the large trucks at the elevator it’s a massive job, much different from the days when I grew up on the farm with a tractor pulling the combine and a tractor hauling the wagons to town. 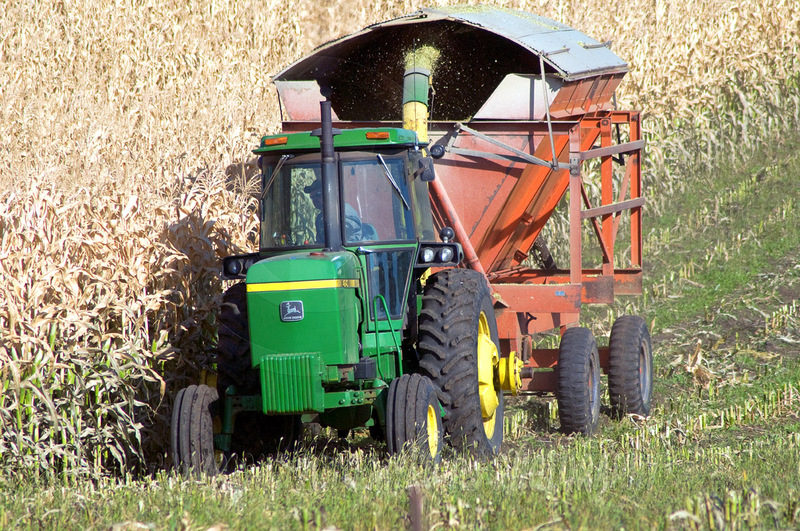 It’s one more step in the process of feeding the world, a job that North Dakota farmers do with superior results. They must be travelers pausing on their way through little old Wilton. 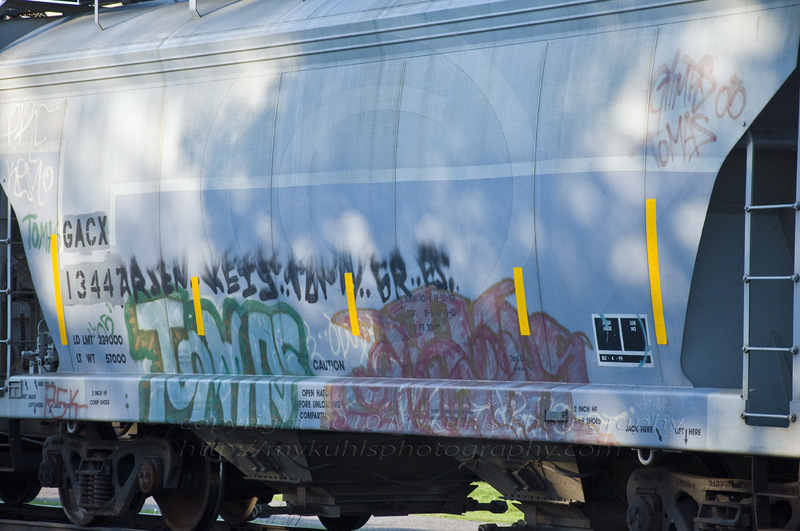 The sides of those rail cars, like passports, bear the stamps of far away places where they’ve stopped and been marked. The artistry renders the language in to a cryptic cipher. I struggle to read them, but to someone I’m sure they mean something, perhaps a branding of a network, a neighborhood, a gang, or just an expressive person. 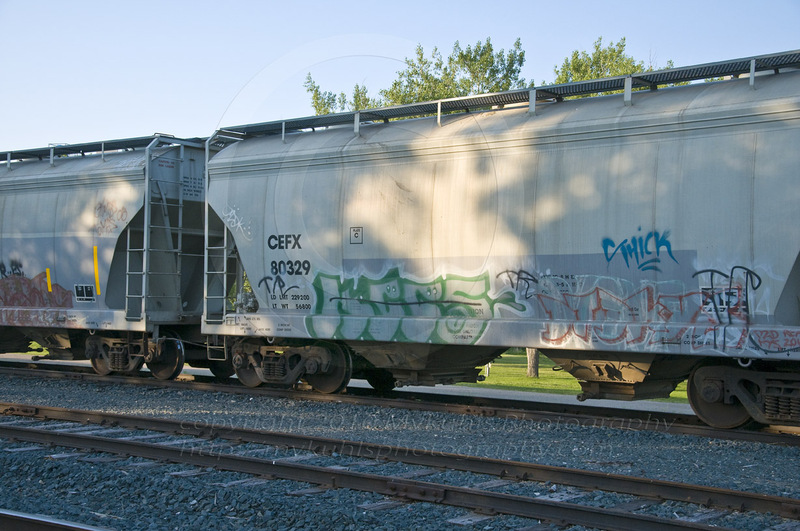 Eventually, they end up parked at Wilton near the grain elevator waiting to get loaded so they can go back to the home turf of the artist who branded these cars. I imagine the patient work that goes in to rendering the straight lines, the shadows, the depth. I imagine cardboard used as edging and a whole lotta shaking of the cans as the artists rough out what it is they’re trying to say. 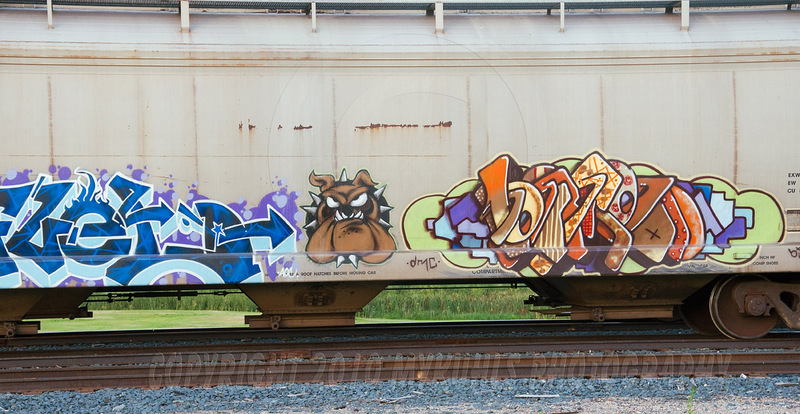 Around here, graffiti artists just aren’t that creative. 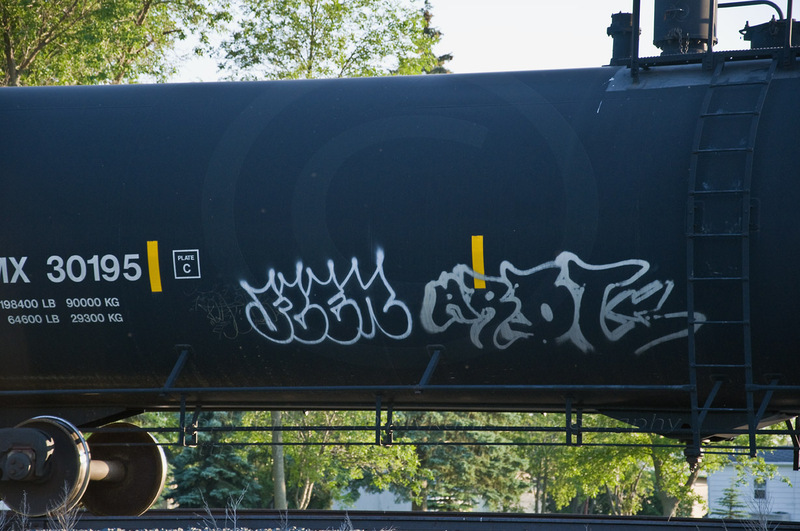 They grab a can of spray paint and spray their graduating year, and that’s it. The Wilton Farmers Union Elevator is adding on this spring. That’s a good sign. 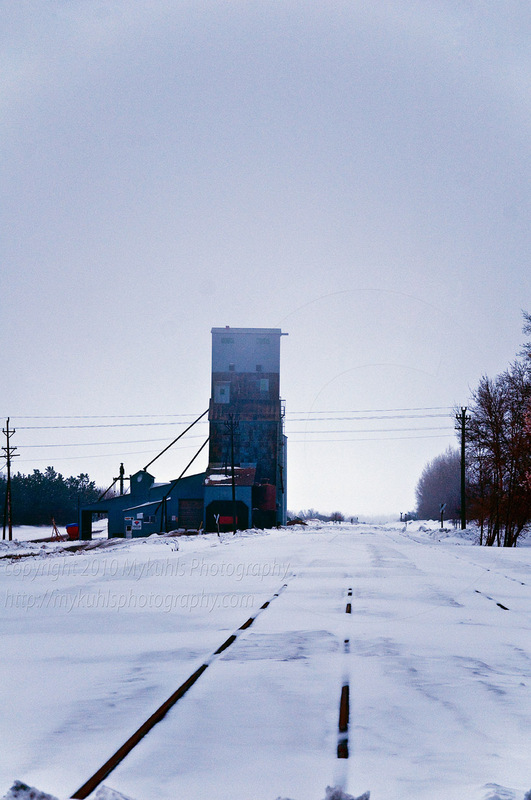 With as many abandoned grain elevators out here on the prairie that have been left behind when the railroads abandoned small towns, it is good to see one small town elevator adding on. At one time there were several elevators in Wilton on the rail line. Now, they’ve been incorporated in to one large system. 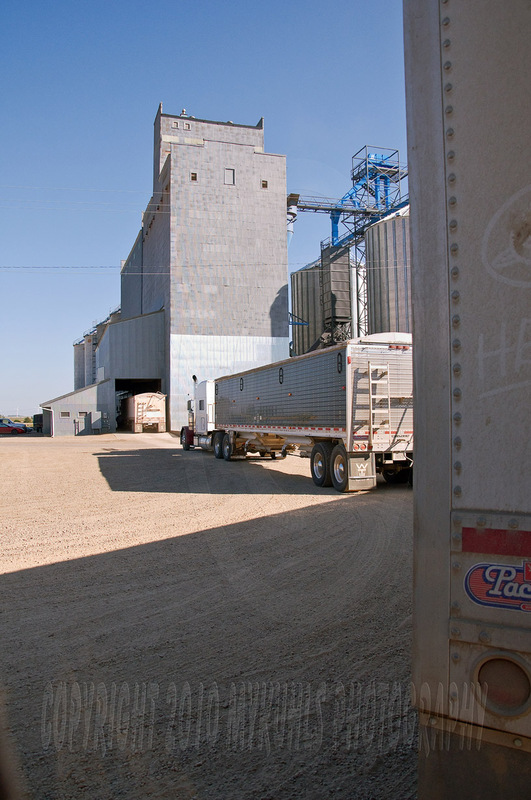 Just one grain bin in today’s elevator is as large as that first elevator that was built here in 1900. Quick! Catch it before it’s gone! Those last golden rays of the day. The Golden Hour is a photographer’s gold mine. 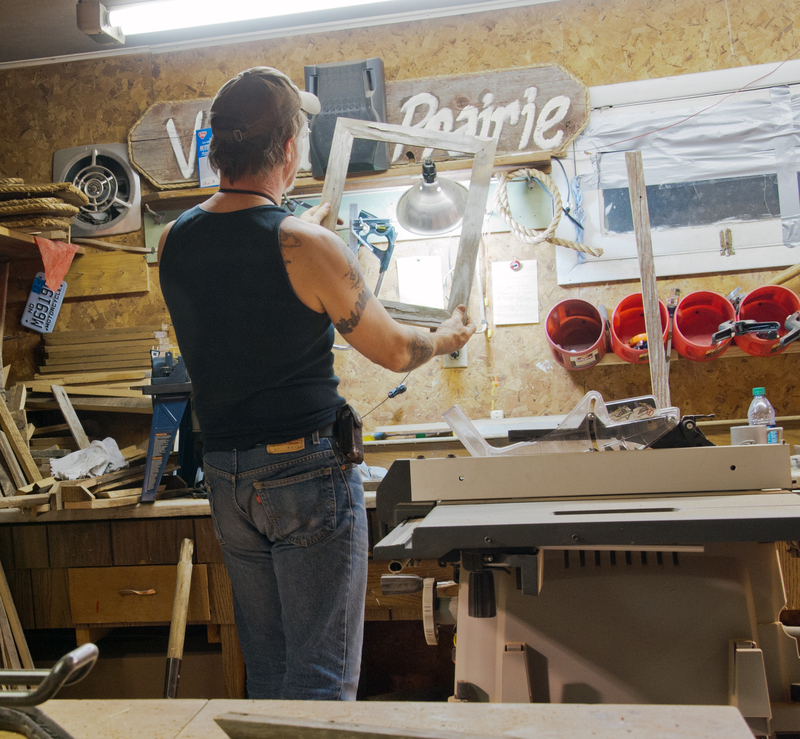 If prepared, a shooter can find the right place to wait for the light to turn to gold. Waiting too long and it’s gone. 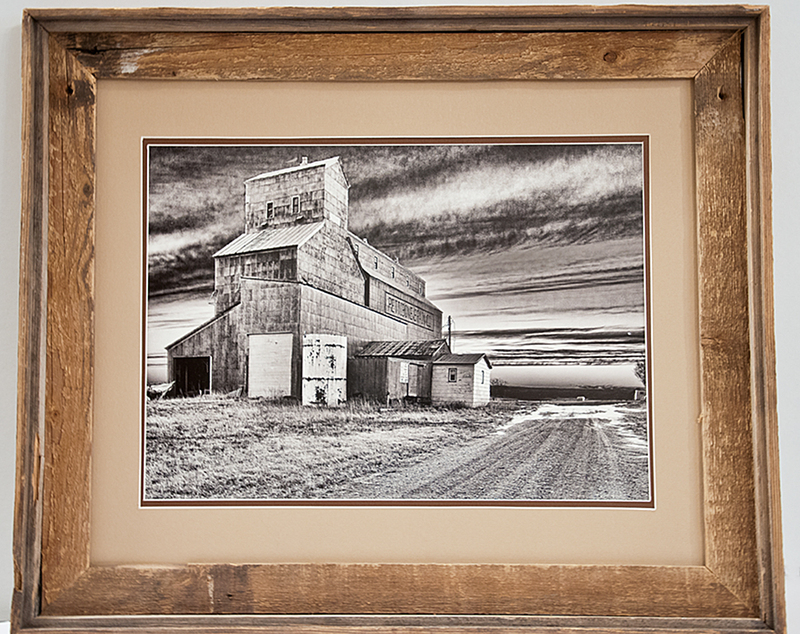 The Wilton Grain Elevator is a perfect example of how the golden hour casts its glow on the scene. Notice how the sky and the snow are already turning dusky lavender? The elevator soon would follow, but at just that moment, I got to catch its reflection of the sunset. 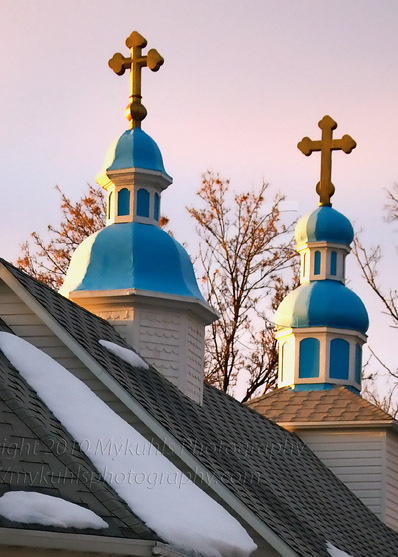 Two of the three egg-shaped spires of the Ukrainian Catholic Church in Wilton were my first images of the day to try to capture at sunset, the golden hour. Soft and gentle against the pink sky, they make a sharp contrast with the sunset lavender in the clouds. 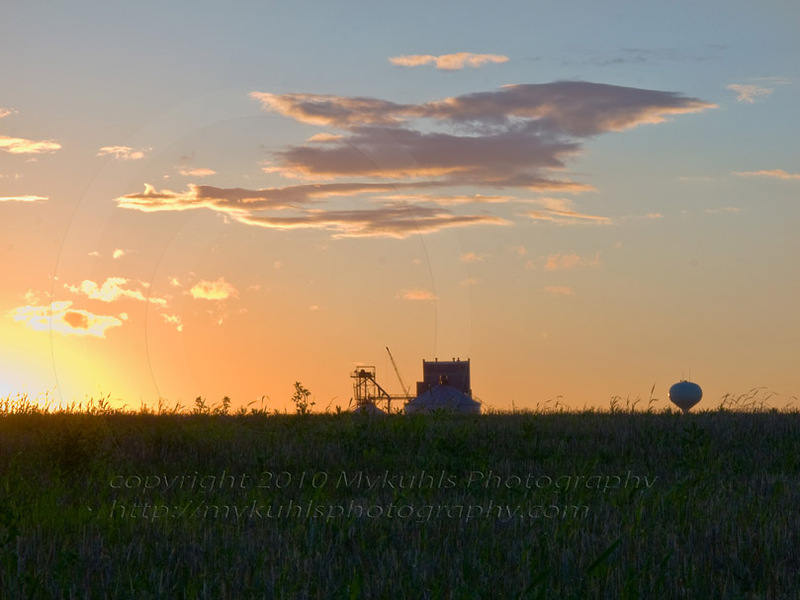 Still, though it was the grain elevator that caught my eye and I fell left the best example of The Golden Hour. My hunt for my day’s photo today was not as thrilling as in previous excursions. 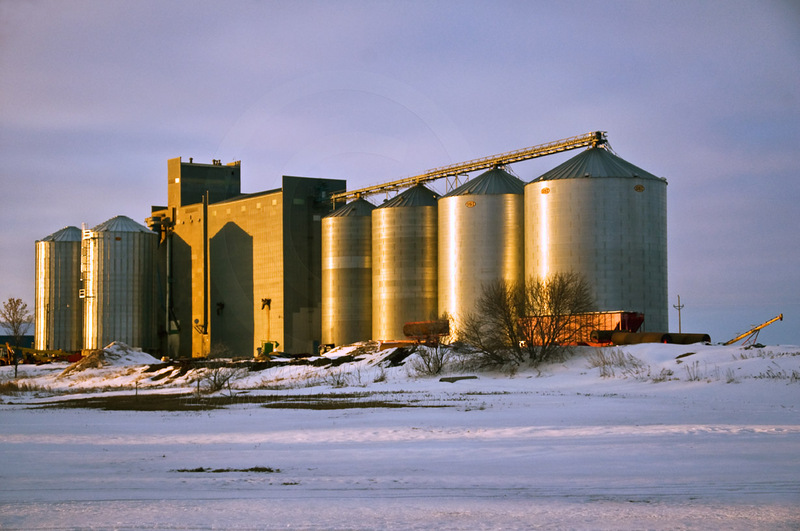 On the eastern edge of Wilton is the older of the two grain elevators. 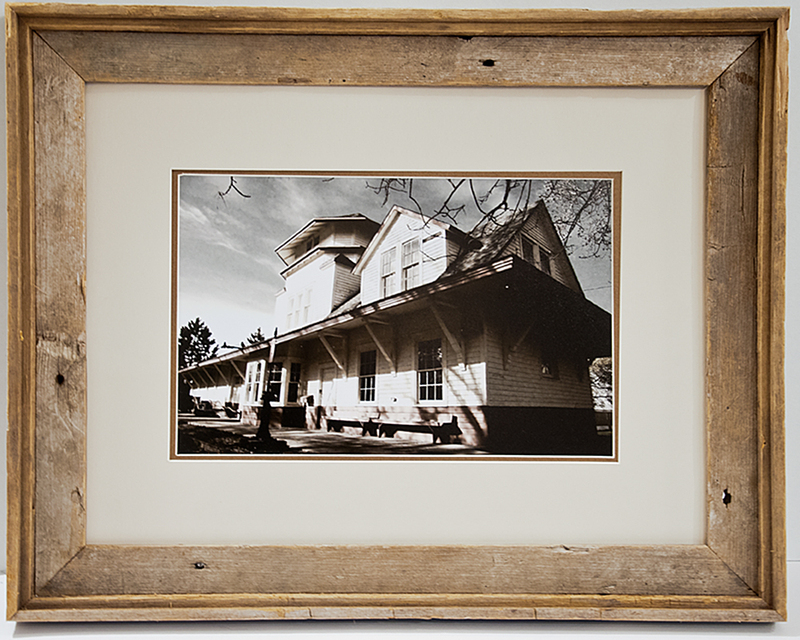 It was one of several that once stood in Wilton in the 1920’s. 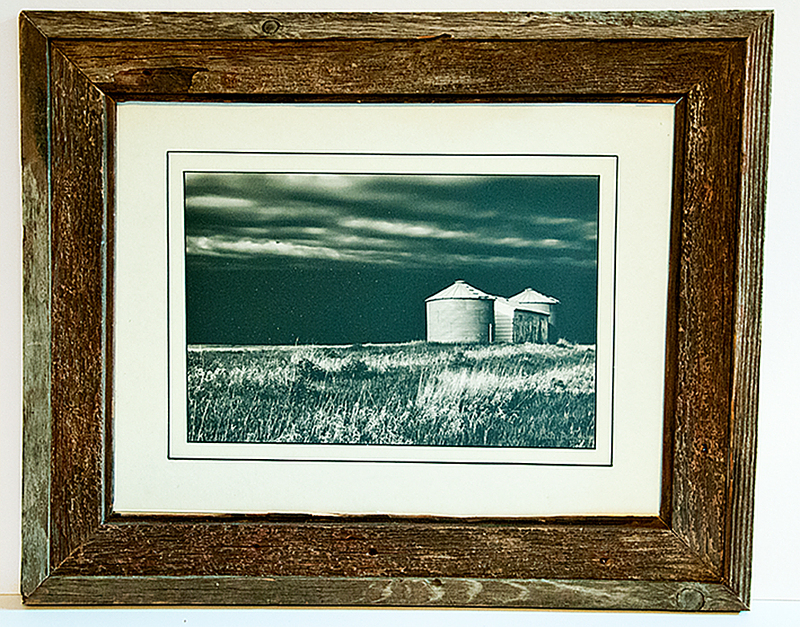 A 1922 story in the Bismarck Tribune said Wilton’s Elevators could e seen 14 miles away. Not today, they couldn’t be seen. The fog from just a few blocks away nearly obscured the top of the elevator. To the north, Wilton’s newer grain elevator is also capped in fog. 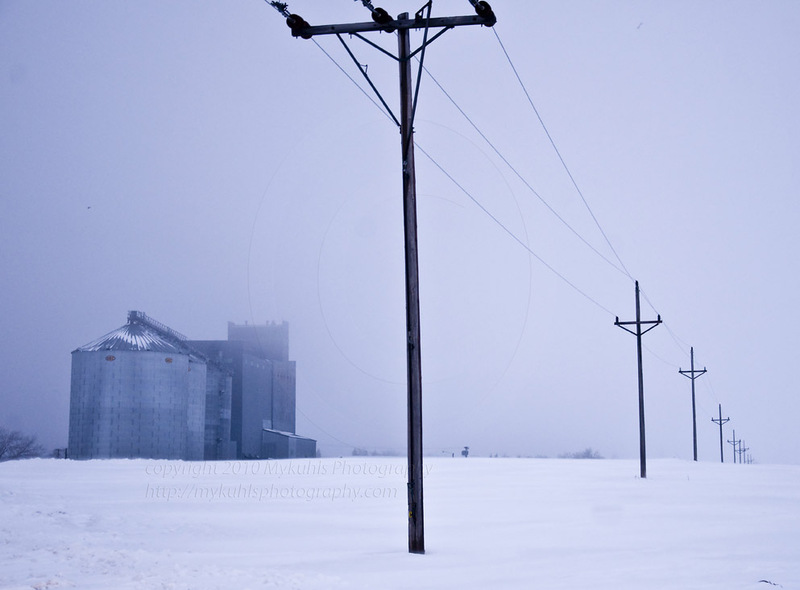 The power lines running north past the elevator disappear in the fog. I’m so tired of fog.